Air Conditioning has become an integral part of our life that most of us take for granted. We switch the air conditioner on and fiddle with the thermostat to set the correct and comfortable temperature in the room. But, what about installation? Most of us expect the air conditioning system to be installed by the dealer when we buy one from them and there are good reasons for that. We will explain why in this article. One of the most important aspects of air conditioning installation is the size. Even if you have the most expensive calculator in the world and the complete calculation logic in your fingertips, you can never get what an air conditioning installation expert has – experience and training. 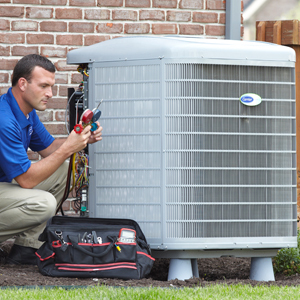 Having installed air conditioning systems a large number of times, and in different homes, an expert has the knowledge and experience to be alert for small nuances that make a huge difference. These are things the average eye would just skip through. Does the room have an alcove? Does it have a large window? How many hours of sunlight does it get? How is the heat shield in the ceiling? The eye to look for these and much more such factors and the knowledge to tackle them only comes from experience. Companies like Carrier constantly train and re-train their dealer technicians. The reason or need for this is the speed at which air conditioning technology is changing. Carrier is pushing technology to eke out the last bit of efficiency from its blowers and compressors. Modern air conditioning systems work with an intricate network of sensors that constantly watch the inside and the outside environment, and constantly send data to onboard computers. It is the computers that decide how the air conditioning system functions. An expert air conditioning installer is taught to understand where to install the sensors, how to accurately calculate the size, and execute an optimal installation. Inefficient Operation. An air conditioning and heating system not installed correctly will be operating inefficiently all the time. The National Institute of Standards and Technology (NIST) has determined that faulty installation could lead to nearly 30% increase in utility bills all the time. Frequent Breakdowns. When an air conditioner is not working within its prescribed limits, it will have more wear and tear and will fail more often. This means you are not only uncomfortable all the time, you will also have to spend more just to keep the air conditioning running. Faulty Airflow. An improper installation could also lead to improper and air flow. Leaky ducts and windows, blockages and other factors can force an air conditioning system to work harder and even longer that it really should. This will inevitably lead to more repairs and maintenance costs, and even early system failure. You would certainly be looking at a shorter life of the air conditioner.